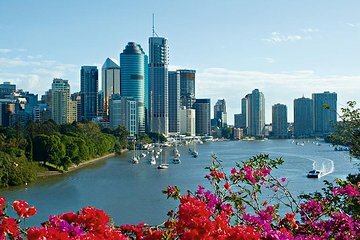 Get a fantastic introduction to the history and attractions of Queensland’s charming capital with this 3-hour Brisbane sightseeing tour. See city highlights like Parliament House, Treasury Casino, China Town and St John’s Cathedral on a coach tour. Enjoy a refreshing morning tea while onboard your cruise along Brisbane River. This morning sightseeing tours is perfect for first-time visitors to Queensland’s subtropical capital city. After pickup at your hotel in an air-conditioned coach, listen to your driver’s informative onboard commentary as you pass local attractions. Learn about the history of Brisbane and its modern growth as you drive by highlights including City Hall, St John’s Cathedral, China Town, Parliament House and Treasury Casino. Head up to Bartley’s Lookouts and Kangaroo Point for a marvelous hilltop perspective. Next, make your way to the waterfront and board a river boat for a cruise along the gentle currents of the Brisbane River with your devonshire tea. Your 3-hour tour concludes with drop-off back at your hotel midday, leaving you plenty of time to continue exploring on your own in the afternoon. We only had 1/2 day so we wanted to get a lot of value in a short time as we had arrived from the USA the day before and were boarding a Princess cruise in Brisbane that same afternoon. Bob who we understand is a walking encyclopedia of Brisbane really lived up to that legend as our Tour guide. He showed us all the sights in a 3 hour period of time and ended the tour with a nice relaxing river cruise and morning tea. We found out about the history of the city and also saw things like the botanical gardens etc. and had a great sense of humor and was a pleasant fellow as well. The company that runs the tour JPT really runs a nice operation, we were picked up from a hotel several blocks from the TRYP where we were staying and taken to the central Transportation Terminal on Roma St. We also had some nice fellow passengers with us on the tour. Overall a very memorable visit to Brisbane. After our cruise we stayed in Surfers Paradise and today did another tour with JPT to the Australia Zoo. It continued in the same level of excellence that the Brisbane tour provided. Bob was a wonderful tour guide and very knowledgeable and helpful. A very good inclusive tour and river cruise. Tea and scones on cruise was tasty. Would have been nice to have return hotel drop offs for those not continuing afternoon tour. If your short on time its a good way to see alot. This tour was not what is described. It was WAY over priced for what was offered and a waste of money. Bob was a really good tour guide! Only comment is the River Cruise the coach needs an upgrade. It was reasonably good, although I thought the city of Brisbane could have been sold to us better and the tour guide more sensitive to non-english speaking people. It could have been slightly less expensive too. It was great and comprehensive. I loved it, THANKS.